Several soon-to-open markets in Oakland will not only offer groceries, wine, and beer, but also sustainably sourced takeout food. 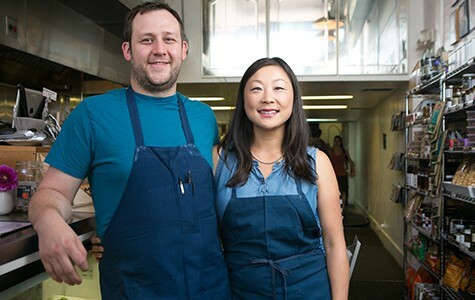 David Wasem and May Seto Wasem of Grand Lake Kitchen. Inside a building with taped-over windows at the corner of 17th and Webster streets in Oakland lies a mish-mash of objects: a row of boxed cabinets lining one wall, a lone stove propped against a pillar, piled papers sitting atop a barrel table, and a narrow mezzanine overlooking blue-tape outlines on a hardwood floor. This fall, the owners of the soon-to-open Howden Market hope to turn the space into a different kind of eclecticism: a shop where customers can stop by on their lunch break and grab anything from a cup of coffee and jar of artisan jam to a wrap for on-the-go eating or a smattering of groceries for later. The opening of Howden Market is part of a larger trend in Oakland and speaks to the changing culinary habits of households, not just here, but throughout the country. Since the middle of the 20th century, people have been spending less time cooking, according to a 2013 study in Nutrition Journal. Yet the trend toward eating out has leveled off, meaning that people want to cut down on cooking time but still eat in their own homes. Not surprisingly, the NPD Group, a market research company, predicted in 2013 that the takeout food industry would grow by 10 percent over the next decade. And a number of up-and-coming businesses in Oakland are putting a local spin on this trend, championing the convenience of prepared food along with goals like sustainability and community-building. Doug Washington, who plans to soon open the Grand Fare market at 3265 Grand Avenue, pointed to his own increased reliance on prepared food as one of the reasons for launching a business with a large takeout focus. "You get home and I just want to hang out with my kids," he said. "I don't want to spend the next two hours in the kitchen." The market, set to open this fall, will offer a range of takeout fare in addition to a flower shop, coffee, ice cream, charcuterie, cheese, and other curated food products. Newberry Market — which is set to open next year at 1954 Telegraph Avenue, on the ground floor of the former Sears building, now owned by Uber — also plans to offer takeout options in a market setting, albeit with its own distinctive touches. "Loren and I kept meeting for lunch — that kind of seemed to be the common denominator for us," said Ann Thai, who, along with Loren Goodwin, is behind Newberry Market. "All we could find in the Uptown area was sit-down restaurants." Aside from serving prepared food — as well as offering recipes for some dishes for those who aren't too pressed for time to cook — the 20,000-square-foot Newberry Market will function as a grocery store complete with flower and butcher shops. According to Goodwin and Thai, aspects that will distinguish the market from other grocery stores that serve takeout, such as, say, Whole Foods, include a concierge desk to give customers one-on-one help, and the elimination of aisles in the store's configuration. Less than a ten-minute walk away, the 2,300-square-foot Howden Market aims to serve a similar function in a smaller space. Located next to Spice Monkey Restaurant & Bar and owned by the same people, the market will offer the same specialty teas and spices that Spice Monkey is known for, in addition to take-home meals, beer and wine, and a small selection of groceries. General Manager Russell Bass likened the market to a "sustainable convenience store," where one might simultaneously grab a to-go lunch and pick up food for the next meal. Prepared food to go is also emerging more in the local restaurant scene. Communite Table, which opened last year at 4171 MacArthur Boulevard, began with the primary aim of providing to-go options. A large deli display showcases pork and turkey meatloaf and roasted yam and black bean salad; customers can also sit down for lunch in a teal-and-white dining area reminiscent of well-kept kitchen. Owner Michele LeProhn sees the takeout trend as partly a consequence of the popularity of eating out. "[People] want to have some of those same options at home, but they can't do it themselves," she said. 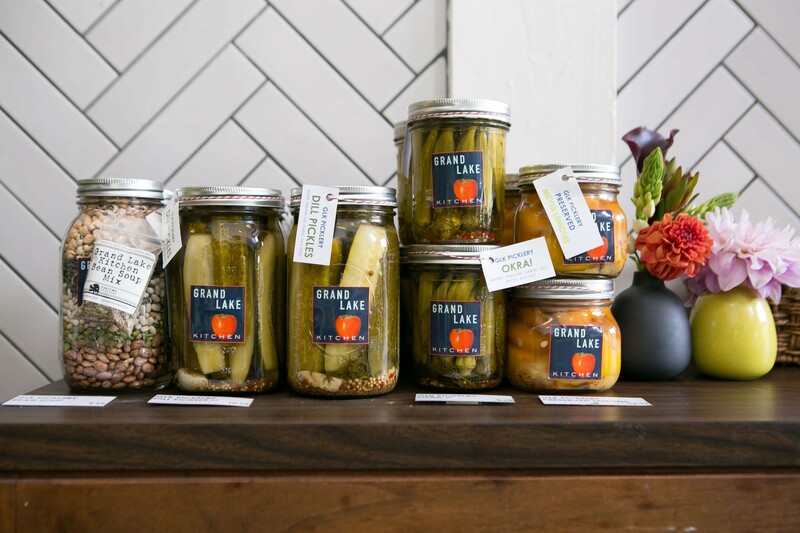 Products at Grand Lake Kitchen. Unlike Communite Table, Grand Lake Kitchen at 576 Grand Avenue is more of a restaurant at its core, according to co-owner May Seto Wasem. Still, the restaurant does a lot of takeout orders and has a varied deli selection, as well as a small section of grocery items and beer and wine. "It was a little bit sleepy over here," Seto Wasem said of her neighborhood when she moved in. "There was nothing that was convenient or fast." These hybrids of takeout and sit-down food businesses have local precursors — LeProhn, in fact, took inspiration from her former workplace, Poulet in Berkeley (1685 Shattuck Ave.). Marilyn Rinzler founded Poulet in 1979, recalling that, at the time, "There hardly was any takeout food [in Berkeley]. The process didn't exist — there was basically pizza or takeout Chinese. Whole Foods wasn't here. Berkeley Bowl wasn't here." Poulet mainly serves chicken, salad, and sandwiches and offers space for dining in, but makes most of its sales through takeout orders. Rinzler said she's seen prepared food become increasingly popular, noting the existence of new food services that are delivery-only, further upping convenience. Beyond catering to the trend, though, Rinzler sees Poulet as having become a fixture on its side of Berkeley — an endpoint that most of the new purveyors of takeout food in Oakland hope to reach, despite their focus on grab-and-go food. "We have a lot of regulars," Rinzler said. "We're just a neighborhood place." East Bay game store owners give their recommendations for the best board games to gift and play this holiday season. From the hottest styles in dog fashion to the trendiest treats in all-natural cat food, here are some of the best East Bay gifts for pet lovers.